This Wayfair Holiday Sale Will Make Your Home Look Majestic Just In Time For Thanksgiving! The deals are coming to town! Up to 85% off goods like fireplaces, furniture, kitchen, and dining goods! Here ye, here ye: The time has come for the ~Home For the Holidays Sale~ at Wayfair! That means there's up to 85% off fireplaces, furniture, kitchen, and dining. FYI, the sale starts today and runs through the Friday the 16th. So now's the time to replace your lackluster stuff before your whole fam comes over for the holidays! 1. 85% off an upholstered storage bench where you can stash the stuff your kids forgot to put away (even though you told them to do that before everyone arrives to open gifts). 2. 74% off a handsome coat rack that'll help out a mudroom overburdened with visitors' outerwear. 3. 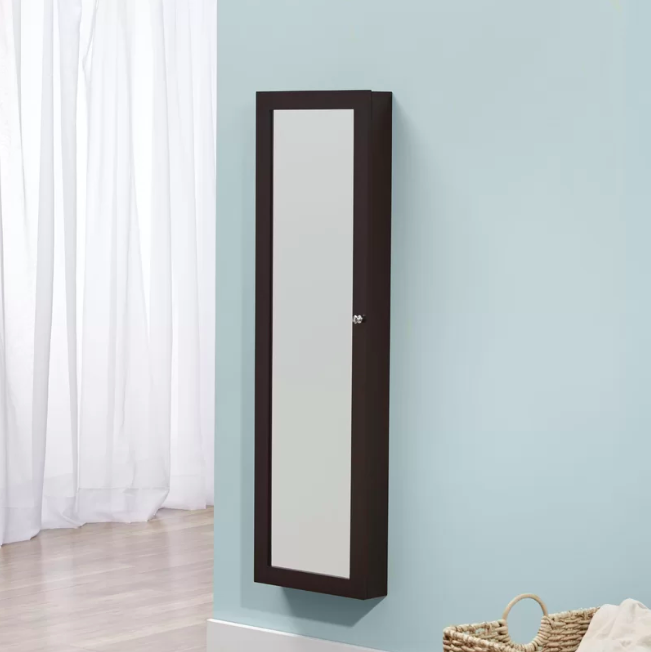 72% off a colorful cabinet which will quickly become the star of any room where you place it. 4. 68% off a four-tier shoe rack with enough room for 12 pairs. So this can *really* come in handy. And it's so cheap you might as well buy two! Did I mention they're stackable? 5. 77% off an LED wall-mounted electric fireplace to make your home feel warm and even more welcoming. It has a heating coverage area of 400 square feet and maximum BTU output of 5000 BTU. 6. 81% off a gracious tufted ottoman a few loved ones can perch on for the perfect camera angle to see a puppy gift revealed! 7. 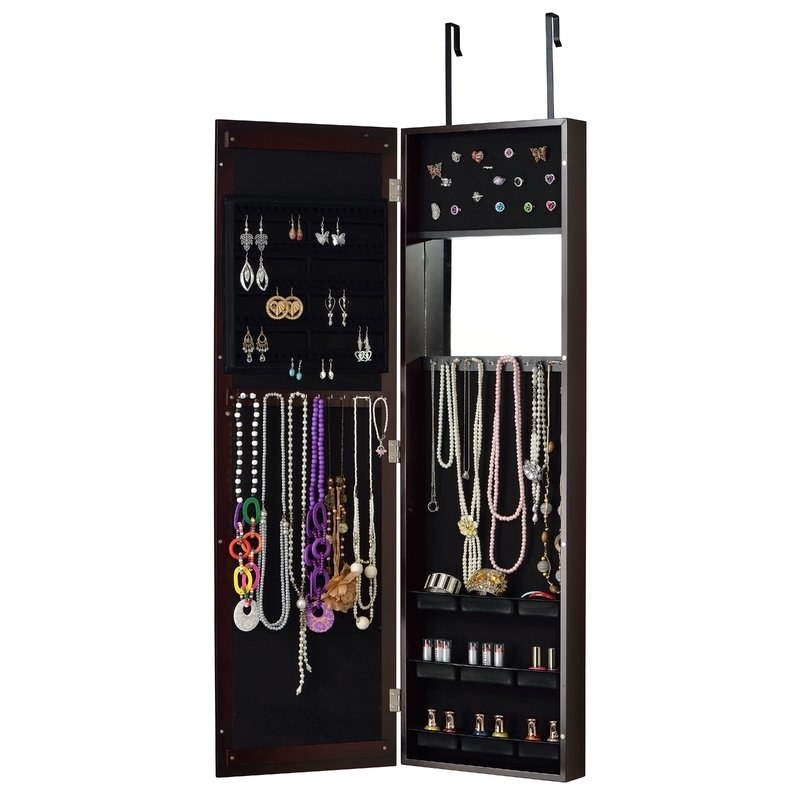 67% off a jewelry organizer cabinet to mount on the wall or hang on a door. So really it'll work as hard as Santa's elves. 8. 64% off a cube wicker basket that'll help tidy up all kinds of spaces (and could make a good base for a DIY holiday gift basket)! 9. 80% off a chic upholstered headboard to earn the approval of your in-laws in your guest bedroom. 10. 60% off a gorgeous coffee table that'll *magically* hold so much but seem to take up a smaller amount of space due to its shape. 11. 68% off a pretty loveseat to expand your seating options in case you're hosting the family gift exchange this year. 12. 77% off a retro-inspired TV stand with some hidden storage and open shelving that can house some of your holiday decor. 13. 77% off a nautical-inspired pouff that'll help you can kick back, relax, and watch Christmas Vacation for the gazillionth time. Is that just my family? 14. 70% off a five-drawer dresser that may just help house all the clothes you've asked Santa for this year. 15. 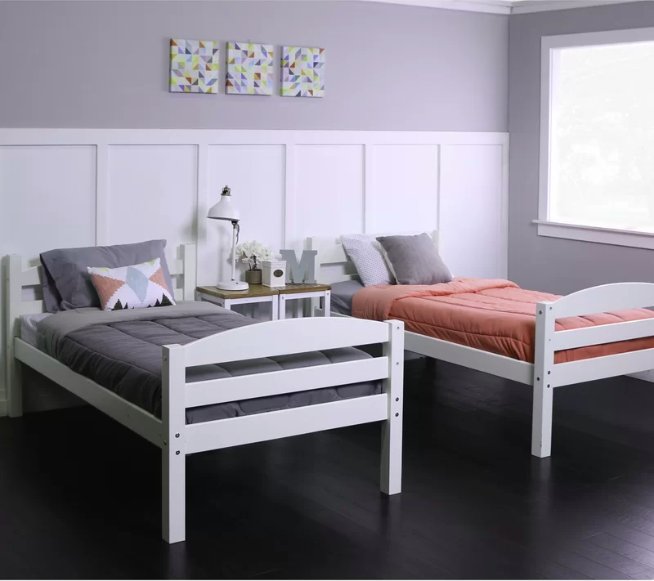 62% off twin kid's bunk beds you can stack or not! The grandkids will adore them either way. 16. 69% off a garment rack that'll come in handy more times than you can count! Really. 17. 68% off a rocking chair with some serious personality to ~sleigh~ the seating competition. 18. 76% off a fireplace mantel shelf with pull-out drawers on the sides as a clever storage option in more way than one! 19. 76% off a molded dining chair available in nine colors as a way to bring some modern edge to your dining space without sacrificing comfort. 20. 67% off an upholstered platform bed that'll impress when your distant relatives over for Christmas brunch inevitably snoop in your master bedroom. 21. 74% off a cozy side chair because you could always use another place to curl up with a good book in a last-ditch effort to work through your 2018 reading list. 22. 73% off a three-drawer nightstand you can throw a bunch of stuff into when you need to prep your college-aged kid's room for a visiting relative who's here for the week. A WHOLE WEEK! 23. 65% off a kid's recliner that'll help them feel just like you and kick back, relax, and watch some quality toons. 24. 68% off an adjustable work table to help you gain some prep space for playing The Great British Bake Off while whipping up some gingerbread cookies. It's stainless steel with an adjustable bottom shelf that can hold up to 150 lb. 25. 66% off a patio bar set you could, tbh, put in your man cave or basement for some extra holiday entertaining help. And then when the weather warms up you can move it outside! But wait! These gorgeous things are just skimming the surface of the deeply discounted finds. Browse the rest of Wayfair's Home For the Holidays Sale!